Lotto Race is a brand new, unique and highly addictive lottery based gaming site. To play you simply select your lucky numbers and compete with other players to win instant cash prizes. By signing up with them today you will get a free £5 (no deposit necessary) added straight into your account to give the games a try. After this you can deposit £10 into your account and get a further £20 free, giving you £30 to play with. LottoRace.com is a brand new, extremely unique and highly addictive gaming site. The game itself was previously played on Facebook for fun and attracted over 1 million registered players who placed over 850 million virtual bets. 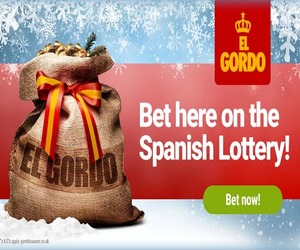 The site is completley different to any other lottery game as after picking your lucky numbers you can play in any one of a selection of different games which all offer instant prizes. Other differences are that you can win a prize in every game, 100% of the prize money goes straight to the winners and the odds of winning are as good as 1 in 2. As well as winning small amounts in an instant you can also play in daily or weekly tournaments where you can win much bigger cash prizes. As well as playing the games and winning lots of money you can chat, have fun and make friends with other players from all around the world. Opening / Special Offer: For signing up with them today you will get a free £5 added straight into your account. After this you can deposit £10 into your account and get a further £20 free, giving you £30 to play with. More details on this can be found in your account area. Players Information: To play in the games you must select 7 lucky numbers from 35 and up to the maximum amount of lines for each race. The game starts once all the lines have been bought. Once the race starts balls are dropped from the pot and must match your lucky numbers. The player with the most matches after each draw wins the pot. It really is as simple as that but I have to say that it is highly addictive. Payment Options: The first £5 is completely free and does not require any payment details to get it. To withdraw this bonus though you will need to wager it at least 15 times. After this you can deposit with Visa, Mastercard, Maestro, paysafecard, Skrill, Clickandbuy or Neteller. Winnings: Withdrawals will be processed within 4 – 72 hours after your request and can be sent via any method that you used to deposit apart from paysafecard.